On March 19, Michael Paulson reported in The New York Times a wonderful development: the arrival of a new cadre of leadership of women and people of color to the American Theater (“Doors Open for Women and People of Color at Top Ranks of American Theater”). This is a moment for celebration. It’s also a moment for reflection on why these changes have taken so long (in part, as Paulson notes, because many white male founders are just now retiring and/or being sent packing for various offenses). And it’s a moment to ready ourselves to make more substantial changes, as we work to fulfill the promise of moments like these. To state the obvious: diversity is a good thing. Diverse points of view enrich our own experience, deepen our humanity and help us learn. Diversity in the arts strengthens our ability to serve and grow our audiences, reach new funders and donors and chart a path towards greater relevance in the future. This is of course a tricky topic to talk about, especially as a white guy like me. And I hope I can thread this needle without offense – and apologies in advance if I can’t. But for far too long we in the American Theater have been too complacent in opening the doors to the full spectrum of the American Experience, and in dismantling the White Privilege that has existed not only at the core of American culture but also at the core of American arts. We have talked about (and acted partially on) our desire to champion voices of color, but too often the argument has stopped short of looking around and challenging the fact that the vast majority of leadership has been – and is – all too white to truly signal a desire to engage and be of, for and by all people. I say all this as a white man – and one who, like much of America, is on a constant journey of discovery to realize – and own – how much privilege I inherited upon my birth. I’ve been lucky to have met two of the people discussed in The New York Times article – Jacob G. Padrón and Robert Barry Fleming, two brilliant people who will do extraordinary work at their new posts. And even though I have not had the pleasure of meeting Maria Manuel Goyanes, her reputation as a person and artist precedes her arrival at Woolly Mammoth (a company I care about dearly, as a former DCist). The same with all of these individuals. These women and men are some of the best and brightest – and these theaters are lucky to have them. Their arrival we can all cheer. And yet, as Ms. Goyanes points out in the very same article, their arrival is not quite yet a sea change. In looking more closely at the data gathered by San Francisco Bay Area-based theater directors, Rebecca Novick and Evren Odcikin, we can see that out of 87 Artistic Director positions filled since 2015, 23 were filled by artists of color, but another 64 were filled by white artists. At the same time, 36 are women, but 51 are men. And while two trans or non-gender conforming artists were appointed to leadership roles, the vast majority of them – 85 – are cis-gendered. So our celebration of this moment needs to be tempered by a sober view that a vast disparity still exists. And that these leadership changes are not enough. These shifts need to be accompanied by changes at the board level, with more leaders of color being asked to serve as the ultimate trustees of our theaters. And at the middle staffing level, in order to grow a body and community in each organization connected with more diverse experiences. 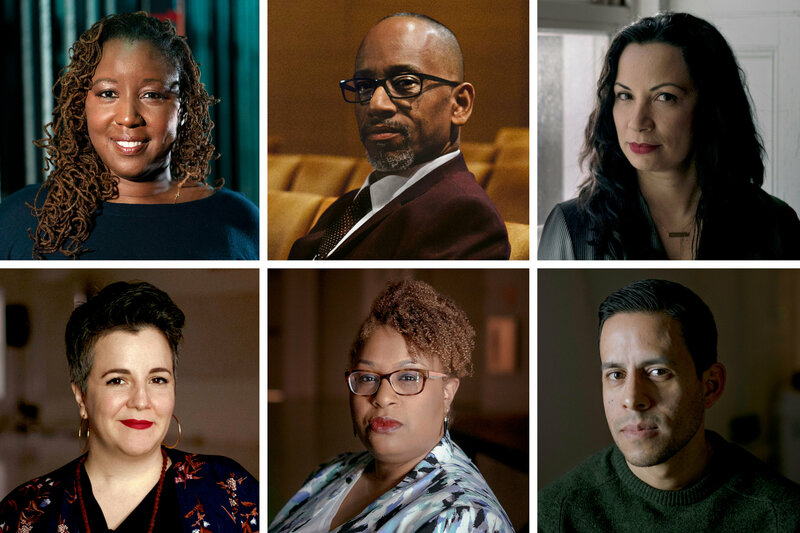 Of course, it’s also the hope that these leaders of color will bring a new wave of support to artists of color, to bring more diverse stories to our stages in order to engage and grow audiences of color. But if we do not change ourselves at all these levels, we will be asking these individual leaders to pull off a magic trick. I’m especially heartened by the choice of Nataki Garrett to lead the Oregon Shakespeare Festival (OSF). Because the OSF has been becoming one of the most authentically diverse companies, in its staffing and programming, this leadership transition was especially important. Would the board replace Bill Rauch with another white person? Or would they tack towards supporting the growth of authentic diversity that’s been growing at all the other staff levels in recent years? Their choice of Ms. Garrett underlines their commitment – and that this Shakespeare Festival doesn’t need a white man – or a white Brit – to lead it. Regardless though, the choice is simply a testimony to Ms. Garrett’s talent and leadership. We need to emphasize that her talent and hard work got her there, not her race nor her gender. As the leader of a theater that once hosted vaudeville AND minstrel shows, I am in the process of exorcising our past, finding the grace of artists of color who did perform here with honor and acclaim (like the Fisk Jubilee Singers way back in 1900) and discovering how we, here in rural America, can serve and move forward the need for greater diversity in our work. One way is through new programming and projects dedicated to supporting our LGBTQIA+ brothers and sisters. Another is in continuing to find new ways to engage women and artists of color as staff members and in productions, residencies and special projects, in a similar way to the early days of our theater, when artists from around the country would come to Hubbard Hall and share their talents with the largely homogeneous (white) local community. We also need to engage our local populations of color who might not have had a good reason to engage with us – yet. So what can any of us do in our own backyards? We can seek out more diverse points of view, in color, socioeconomic background, age, in any way, in the art we’re consuming and in our daily interactions. We can challenge ourselves to reflect on what borders and walls exist in our own minds – and whether they should be there. We can ask, if we’re not connected to any one truly different from ourselves, why that is – and if it could be different. We need to rightly celebrate these leaders – for themselves, more than for the color of their skin or their gender identity. And we need to keep up the good fight and not just put the pressure on these few leaders to change the world overnight. As we’ve re-learned in the post-Obama era, it’s going to take a while – and take all of us – to make the change we all can believe in.